The chimeras would be generated by implanting human stem cells into an early pig embryo, resulting in an animal composed of mixed pig and human cells. For the first time, biologists have succeeded in growing human stem cells in pig embryos, shifting from science fiction to the realm of the possible the idea of developing human organs in animals for later transplant. The approach involves generating stem cells from a patient’s skin, growing the desired new organ in a large animal like a pig, and then harvesting the organ for transplant into a patient. Because the organ would be made of a patient’s own cells, there would be little risk of immune rejection. The human-organ-growing pigs would be examples of chimeras, animals composed of two different genomes. They would be generated by implanting human stem cells into an early pig embryo, resulting in an animal composed of mixed pig and human cells. One team of biologists, led by Jun Wu and Juan Carlos Izpisua Belmonte at the Salk Institute in San Diego, has shown for the first time that human stem cells can contribute to forming the tissues of a pig, despite the 90 million years of evolution between the two species. Another group, headed by Tomoyuki Yamaguchi and Hideyuki Sato of the University of Tokyo, and Hiromitsu Nakauchi of Stanford University, has reversed diabetes in mice by inserting pancreas glands composed of mouse cells that were grown in a rat. The Salk team’s report is published in Thursday’s issue of Cell and the Stanford-Tokyo team’s in Wednesday’s issue of Nature. The two reports establish the feasibility of trying to grow replacement human organs in animals, though such a goal is still far off. “I think this is very promising work in principle,” said Rudolf Jaenisch, a stem-cell expert at the Whitehead Institute in Cambridge, Mass. Many technical and ethical barriers have yet to be overcome, but some 76,000 people in the United States are awaiting transplants. 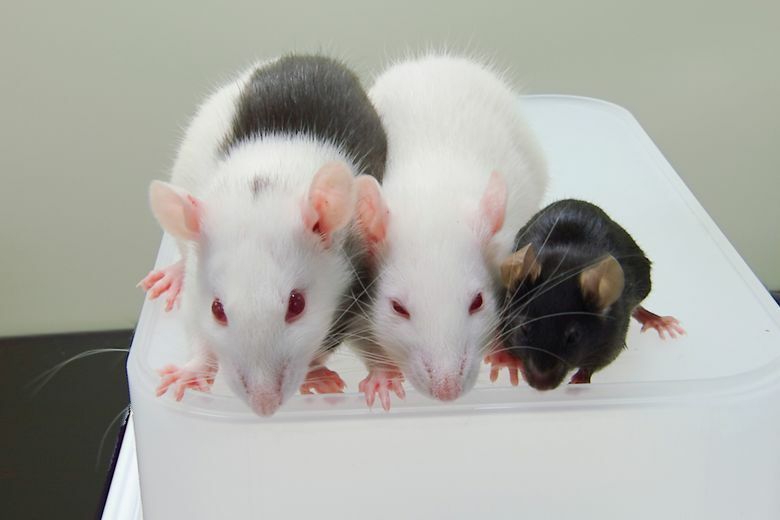 Creating chimeras, especially those with human cells, may prove controversial, given the possibility that test animals could be humanized in undesirable ways. One would be if human cells should be incorporated into a pig’s brain, endowing it with human qualities. Almost no one wants a talking pig. Another untoward outcome would be if human cells should come to compose the pig’s reproductive tissues. Few people want to see what might result from the union between a pig with human sperm and a sow with human eggs. In 2005, Sen. Sam Brownback of Kansas introduced a bill imposing a $1 million fine on anyone creating and profiting from a chimera with human cells in its brain or reproductive tissues. That bill went nowhere, but in deference to public concerns, the National Institutes of Health (NIH) in 2015 instituted a moratorium on using public funds to insert human cells into animal embryos. The ban is in place, and it is unclear whether the Trump administration would continue to consider lifting the moratorium or whether new objections would be raised. “We have no indication one way or another that they have any opinions on this,” said Carrie Wolinetz, the associate director for science policy at the NIH. Izpisua Belmonte’s and Nakauchi’s teams have both pursued a strategy of directing the human-donor cells to generate specific organs in the recipient species. This is desirable for both technical and ethical reasons. Nakauchi has disabled the master gene in rats for making a pancreas so that when mouse stem cells are injected into the early embryo of such a rat, the growing embryo has no choice but to construct its pancreas of pure mouse cells, instead of a mix of rat and mouse cells. Generating inviting homes for the donor cells may reduce the risk that they will be incorporated in nontarget tissues like the brain or reproductive tissues. Also, an organ made purely of donor cells can be transplanted into the donor animal with minimal fear of rejection. In practice, about 10 percent of the mouse pancreases generated in rats was composed of rat cells, because the rat supplies the blood vessels for the organ. But the rat blood vessels seem to be quickly replaced when the organs were transferred to mice. The mice with their new pancreases lived in good health for a year after the transplant. They came from the same inbred strain as the donor mice, so they did not reject their new organs. The result provides proof of principle that Type 1 diabetes can be treated by growing a pancreas from an individual’s cells in another animal, Nakauchi and colleagues concluded. The next step is to repeat the experiment in pigs, which produce organs of a more suitable size for use in humans. Izpisua Belmonte’s team has now shown that human stem cells do survive in pig embryos and help form their organs, although not very efficiently. Both Izpisua Belmonte and Nakauchi said there was a long way to go before human organs could successfully be grown in animals like pigs. Chimeras will be more immediately useful in studying human embryogenesis, testing drugs and following the progress of disease. Both scientists expressed confidence that ethical concerns about chimera research could be addressed. Chimeras are typically mosaics in which each organ is a mixture of the host and donor cells. But new techniques like the Crispr-Cas gene-editing system should allow the human cells in a pig embryo both to be channeled into organs of interest and to be excluded from tissues of concern like the brain and reproductive tissues. “This isn’t dangerous research. We’re not creating monsters,” Nakauchi said. Concern about human cells’ incorporation into a lower animal’s brain is not without basis. Dr. Steven Goldman of the University of Rochester Medical Center found in 2013 that mice injected with a special type of human brain cell had enhanced learning abilities. But other forms of humanized mice, such as mice engineered to have a human immune system, are routine laboratory animals that seem to occasion little angst. Izpisua Belmonte’s insertion of human stem cells into pig embryos was not affected by the NIH moratorium on such chimeras because he used private funds. 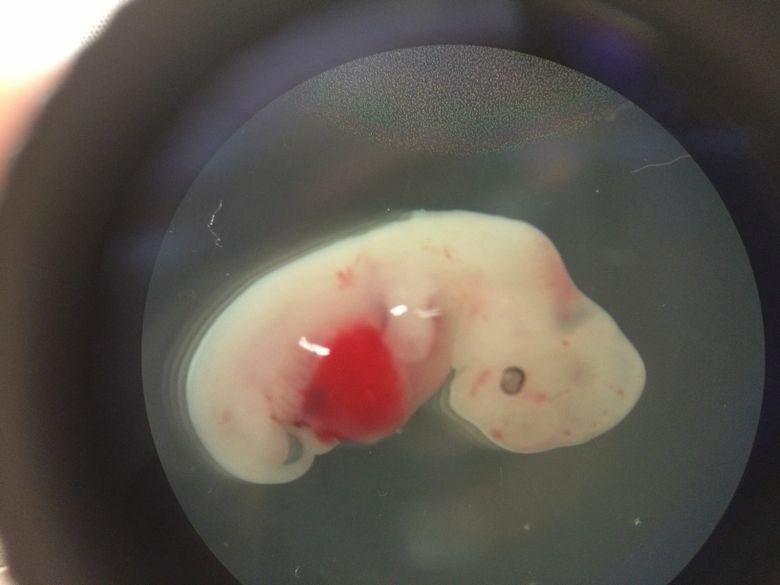 His experiment was approved by authorities in Spain and in California, and following their advice, the development of the pig chimeras was stopped after four weeks in the womb. Nakauchi moved his lab to Stanford from Tokyo in 2014 because Japanese regulations do not allow chimera research, only to be hit with the NIH moratorium a year later, which prevented him from making chimeras with human cells. Ethics experts were also impressed by the results of the research. “It really does give a green light to explore more,” said Insoo Hyun of Case Western Reserve University in Cleveland. Hyun said he understood why some people might object on moral grounds. “It seems kind of creepy,” he said. But, “This is a strategy to help save human lives” and so it is justified if properly done, he said.